“Sorry, we do not have hot water,” the caretaker at the Garhwal Mandal rest house in Sankri announced with a deadpan face. My heart sank. After enduring seven sweaty days and 52 kms on the Har-Ki-Dun trail, I was so looking forward to a hot cleansing shower! And as if to mock me, a chilly gust of Himalayan breeze slapped across my tanned and blistered face– just when I was trying to recover from this unexpected setback. I should have known better. Given Sankri’s erratic power supply and uneven phone connectivity, expecting hot showers in this remote Uttarakhand hamlet was as unrealistic as finding a McDonald’s outlet at the Everest base camp. Disappointed, I lugged my heavy backpack to the room our trek leader had assigned. Even in sweltering heat I avoid cold showers, but here I was, gingerly staring down a bucket of icy-cold water. Holding my breath, I muttered a short prayer, and surrendered myself to the bone-chilling assault. Exactly seven days ago, on April 18, we’d rolled into Sankri–our base camp for the Har-Ki-Dun trek–on a rain-soaked afternoon. Loosely translated, Har-Ki-Dun means the valley of the Gods. Located in Uttarkashi district’s Govind Pashu Vihar Wildlife Sanctuary, the Har-Ki-Dun valley is perched at 3566 metres above sea level. Local accounts suggest that it was Jack Gibson, a teacher at Doon School, who first discovered this gorgeous U-shaped valley, fell in love with it, and popularised the trekking route among his students. The valley offers commanding views of the Swargarohini peak, which is believed to have been used by the Pandavas to enter heaven. Shrouded in thick clouds, Sankri looked decidedly sinister when we arrived. It was cold and a scratched up sign affirmed that Sankri was at 1920 metres above sea level. We were bushed from the long drive on the winding and treacherous mountain roads. Our hearts were still in our mouths because just a few kilometres short of Sankri, we had to drive through a raging mountain stream. The noisy clangs while crossing the stream were ominous but thankfully our car had escaped any real damage. It was still pouring when we checked into the Swargarohine Hotel. We dumped our bags, dried ourselves (in one of the tiniest bathrooms imaginable), and headed to a decrepit diner run by a Nepali family. A steaming cup of masala chai helped soothe our nerves. By late-afternoon there was a welcome break in the weather and the sun finally peeked through the clouds. With our spirits lifted and with not much else to do, we strolled up to Saur, a neighboring village. On our return, we met up with some of the other trekkers from our group. At 6:30pm, we were called to attend a trek briefing where we handed in our medical fitness certificates and liability disclaimers. We were reminded to be mindful of the importance of a light backpack. Our trek leader shared the route we were going to follow: Sankri – Taluka – Dhatmir – Gangar – Osla – Kalkatti Dhar – Har Ki Dun. Dinner that night was a dull affair; the rain was again playing the spoilsport. The lentils and the vegetable were mostly forgettable but the dessert was not. Interestingly, the vermicelli dessert was liberally smothered with fennel seeds (saunf), an odd ingredient but this must be how the Sankri locals like it. By the time we returned to our room, the winds were howling once again and we’d lost electricity. In the dim glow of our of flashlights we reworked the contents of our backpacks until we’d finally achieved the delicate balance between function and weight. Our plan to get a good night’s sleep was foiled by the raucous revelers in the adjacent room who were celebrating their successful return from the Har-Ki-Dun trek. By midnight, the weather gods too had decided to kick things into high gear: Thunder and lighting was followed by a noisy downpour that lasted all night. Hoping against hope that tomorrow will bring blue skies, we somehow drifted off to sleep. Dehradun to Sankri is a 9-hour journey so an early start is a must. You can catch a direct early morning bus to Sankri from the Dehradun railway station. If you’re looking for a more comfortable way, a taxi ride will run you Rs 5500. Your best bet will be to look for a shared taxi. From Shimla, there is a direct bus to Sankri that leaves at 8am. Journey time: 9 hrs. Unless you have an SUV and a stomach for adventure, driving is not advisable because the roads are terrible. Sankri has spotty BSNL coverage at best. Airtel and Vodafone phones won’t work there. The entry fees (for Indian citizens) at the forest checkpoint (near Netwar) are Rs. 150 (for first three days) and Rs. 50 for every day after that. Private vehicle entry fee is Rs 250. If you’re going with a trekking operator, make sure there’s clarity on who picks up the entry fees. Bolero taxis can take you from Sankri to Taluka (11 Kms). This stretch has at least three stream crossings so private vehicles should not attempt to push beyond Sankri. If you do decide to drive in to Sankri, the GMVN rest house there has ample space for parking your vehicle for the duration of your trek. Charge your phones and cameras before you reach Sankri; the power supply is erratic and the voltage too low. We woke up to the sound of rain drops furiously pelting the tin roof of our hotel. The dank weather was playing out just exactly as the Accuweather’s extended forecast had cautioned but we still groaned and prayed for a miracle. Trekking in the rain is no fun and we desperately wanted the skies to clear up on our first day of the trek. 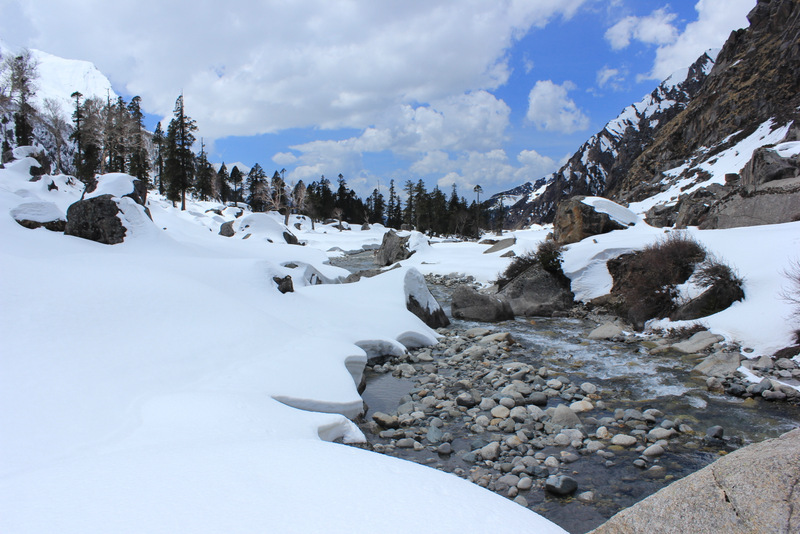 While Sankri was getting soaked, the higher peaks of Supin valley were swathed in fresh snow. For breakfast, we walked down to the diner and gulped down cold butter and jam sandwiches with a cup of hot tea. We collected our packed lunch, strapped on our backpacks, wore our ponchos, and were ready for the start of the trek. The trekking group assembled in front of the GMVN rest house to listen to the trek guide’s pep talk and last-minute pointers. “25 percent of trekking mishaps are caused by undone boot laces,” the guide said in a shrill voice, pointing to a newbie trekker’s laces. The plan, we were told, is to travel to Taluka by jeep and start our first day’s walk from there. It was still cloudy but the rain had stopped for a bit. Our backpacks were quickly loaded onto the luggage rack and we clambered inside the Bolero. Taluka is just 11 Kms from Sankri but it took us almost 60 minutes to cover that distance; the road is treacherous and there are at least three major stream crossings along the way. We’d barely reached Taluka when the skies opened up again. Huddled in a diner, we sipped some more hot tea and patiently waited for the weather to clear up. After 40 minutes, the downpour was now down to a steady drizzle. Around 11am we finally got moving again. We walked past the forest rest house and took the riverside trail. While the original plan was to camp in Osla, the rains held us back. It was then decided that we’ll camp at Bidaka (near Dhatmir) for the night, some 8 kms short of Osla. Covering the 4 kms today was easy because we were mostly walking on level ground. We reached the Bidaka campsite around 1pm. While waiting for the tents to be pitched, we organized a campfire. Soon, the trekkers were busy warming their cold hands and drying their wet socks. As the evening progressed, the skies cleared and by nightfall we were in for a starry treat. After a scrumptious dinner of mattar-paneer and dal, we spent hours spotting shooting stars and constellations. Our hopes for better weather were rekindled as we crawled into our tents for the night. If you’re a real trekking enthusiast, consider starting you trek from Sankri. It’s an 11 Km, mostly level walk to Taluka that takes you through lovely deodar and rhododendron forests. If you get tired, it’s easy to flag down a local Bolero taxi. There are plenty of mountain streams along the way. To wade across some of them, be prepared to take off your trekking boots. Taluka has a GMVN rest house and a forest rest house. If trekking in low season, be sure to check with GMVN Sankri if the attendant for the Taluka rest house is on site. Soon, GMVN will be opening up the Eco Log Huts. The caretaker there said that the opening date could be in June 2014. For the Sankri-Taluka stretch you really don’t need a guide because the only way to get there is by road. Don’t miss the wildflowers along this trail. Taluka does not have a satellite phone but it does have a wireless phone to relay messages to the Sankri forest rest house. We’d camped overnight on a grassy bluff just below Dhatmir village, some 50 feet from a roaring tributary of Supin river. Just as white noise has a calming effect on little babies, the slumber I enjoyed that night was the best I’d had in a long time. After two dreary days, glorious sunshine finally poured down into our tents as we quietly savoured our morning cuppa. We finally got what we’d been praying for: blue skies. It’s funny what good weather can do to sagging spirits. The smiles were back and so was the spring in our step. Our plan for the day was to cover 11 Kms and reach Osla by late afternoon. After a hurried but hearty breakfast, we geared up and got back on the trail. For the first hour or so, the trail meandered through a verdant stretch of shady forest. Although the gradient was steep at times, there were enough descents to make it a comfortable walk. Out in the distance, towering snow-capped peaks glittered in the clear blue sky. Today, the trail hugged the river even more closely, its noisy waters providing the background score in this moving feast of nature. Slushy puddles formed by the recent rains did impede our progress but the walk remained quite enjoyable. Along the way we saw rhododendrons in full bloom; crossed several streams using log bridges; and walked under the shady canopy of deodar trees. By noon we found ourselves approaching Gangar, a village on the banks of the river we’d been walking along. It was our lunch point. Curious kids ran down from the village and made shy requests for “mithai” and toffees in giggly voices. Clearly, these kids were familiar with trekkers and the goodies they tend to carry with them. After polishing off our packed lunch, we resumed our march to Osla. We’d barely covered 500 metres when our group was stopped by an old lady clutching a crying baby in her arms. The child’s hands and fingers were badly burnt in a household accident. One of the trekkers quickly pulled out the first aid kit and bandaged the wounds. Another offered a candy to console the child. The sad reality is that medical services are hard to find in these isolated villages. In the mid-morning sun, the river waters had acquired a shade of deep blue and looked even more mystical. The valley had widened quite a bit by now. The mountain slopes were rocky and mostly devoid of dense tree cover. Lush green terraced fields had been painstakingly carved out of some of the slopes. Instead of walking up to Osla village, we continued to skirt the river and passed through a village called Seema. To reach our campsite we had to cross the cantilever bridge and climb up a steep and rocky hill. By 4pm all of the trekkers had reached the camp. The layers we’d peeled off earlier in the day came back out because it was starting to get cold. A bunch of village kids dropped in to play cricket for some time. Later, these kids helped us gather firewood for our campfire. The long walk had left us exhausted so most of us crawled into our cozy sleeping bags by 9pm. The Dhatmir-Gangar section of the trail is rich in medicinal plants. A good guide will help you locate some interesting plants and flowers. Brown bears inhabit this area but rarely confront humans. There are plenty of water sources along this trail so you could get away with carrying a one liter bottle. Trekking poles will come in handy on this stretch. There is a Maggi point in Gangar but it only opens up in late May. 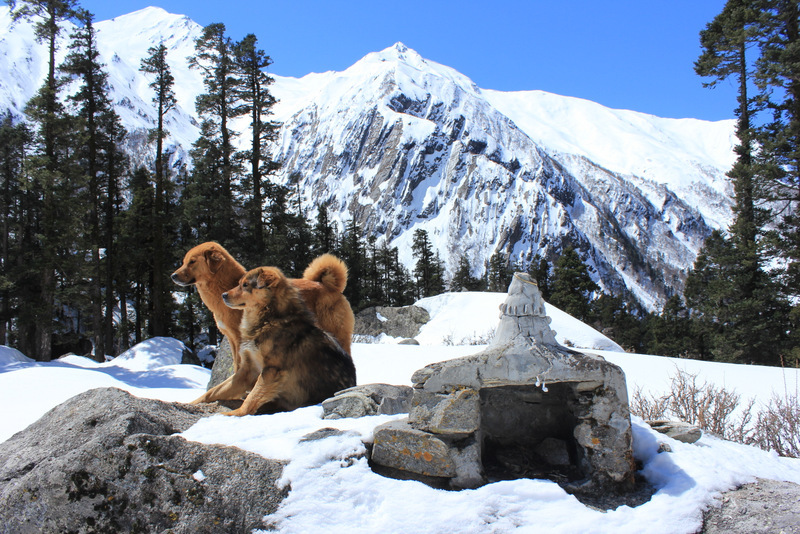 Sheru’s game was simple: At every meal break you would find him cozying up to the trekkers in the hopes of winning some scraps of food. It was easy to tell that glucose biscuits and chocolates were his favorite. The best part was that Sheru would never display any aggressive behavior; all he would do is to give you this adorable you’re-not-going-to-eat-all-of-that-are-you look. It was enough to melt the hearts of even the most avowed dog-haters. When we reached our campsite in Osla, another dog decided to adopt our group. Sheru now had to share the spoils with this new dog. None of us noticed any signs of territorial posturing by either dog so I suspect the night barking had more to do with some other distractions. Some visitors from the wild? A brown bear, maybe? We’ll never know. We’d gained some elevation but it still wasn’t terribly cold at night. Deprived of much-needed sleep, I wasn’t a happy camper that morning. What finally lifted my spirits–and my sore body out of the cozy tent–was the sight of a cloudless sky. Two consecutive days of sunshine were an absolute gift from the Gods. Today’s trek plan was to cover a distance of 9 kms between Osla and Har Ki Dun (via Kalkatti Dhar) and reach the outer edge of the valley by 3pm. If the weather were to turn against us, cautioned the trek leader, we might have to camp overnight in Kalkatti Dhar. Judging from how quickly the valley had warmed up in the morning sun, the risk of rain was almost non-existent. By the end of Day 3, we’d climbed up over a 1000 ft from the valley floor, away from the Tons river which now looked more like a slender serpent from up above. The tree cover had vanished and all we could see around us were rocky bluffs. With our packed lunches secured, and a song on our lips, we marched off to finally meet the scenic valley we’d come for. Like the teaser rates of a home loan, the first kilometre was a breeze and we spiralled down the slope with glee. But that’s when the reality of high altitude trekking put on the brakes. Huffing and puffing, we labored to deal with the sharp and seemingly unending ascent that the mountain had thrown our way. Cursing the weight on our backs–and the organizers who’d billed it as an easy-to-moderate hike–we somehow proceeded to duel with the mountain. Feeling like the little engine that could, we finally negotiated the hill and came upon a clearing. The “lai” (related to the mustard family) field with its glorious yellow hues looked like a grand set from the Bollywood favorite,Dilwale Dulhania Le Jayenge. Another few minutes of walking brought us to some more terraced fields. By now Tons river was hidden from our view. Exhausted from the climb, we settled down to catch our breath in the lush green fields of Kalkatti Dhar. As we continued our ascent, the views of the snow-capped ranges in front and to our right became even more blindingly beautiful. The sun was beating down pretty hard but there was a lingering nip in the mountain air that one could feel when the body was still. We still had a good bit of strenuous climbing to contend with. As we gained height, we now had another challenge on our hands: snow, and loads of it. The recent storm had dumped the white stuff all over the mountain range. Although the snow was stubbornly clinging to the mud, it was steadily losing its battle with the blazing sun; tiny rivulets of snow-melt were giving rise to a slushy and slippery trail. Deep down the gorge, a barely-visible Tons river was there to remind us of how far one could fall if we threw caution to the wind. Snow is stunning until you have to walk through it. Counting on the traction prowess of our Quechua hiking boots, we marched on, one labored step after another. In places, the snow was knee deep. By now the trail had narrowed substantially, making the trek a lot trickier and downright scary. Clearly, this was the “moderately difficult” level our trek guide had alluded to. The mountains were quiet and peaceful; other than the noise of crunching snow and the occasional clang of the trekking poles, there was nothing to break the silence. The reverberations of the roaring river that had been our constant companion for the past three days had left us alone to soak in the tranquility. Even the eagles soaring in the cloudless skies went about their business without a chirp, as if someone had pressed the mute button. Much to our relief, the last few kilometres were mostly downhill. We still had to walk in the snow but it got easier as the day wore on. The trail widened and meandered through snow-covered meadows. The wondrous beauty of nature was mesmerizing; untouched, unspoilt, and so much like a picture postcard! Along the way we saw hillsides completely carpeted with pretty wild flowers. 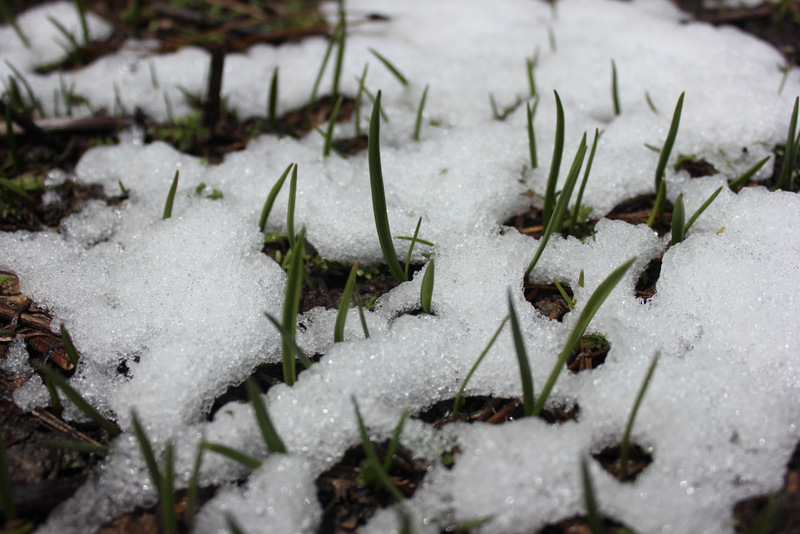 Blades of green grass were starting to burst through the layers of snow. In another few weeks, the village cattle will be out in full force to graze in the grassy meadows. By 3pm we reached our campsite. Surrounded by the towering sentinels of the Himalayas on all sides, this magical meadow will be our home for two nights. We were still 2-3 kms short of Har Ki Dun valley but the trek guide told us that there was too much snow up ahead for the mules to get through. The tents were pitched on a snowy patch hugging a shallow mountain stream. Like kids in a candy store, we stomped around the snow; watched butterflies feeding on nature’s bounty; and savored the awe-inspiring vitality of our pastoral setting until the cover of darkness engulfed us. “Nature is the fuel for our soul. Often when we feel depleted we reach for a cup of coffee, but research shows that a better way to get energized is to connect with nature,” says Richard Ryan, a professor at the University of Rochester. In the warm embrace of mother nature, we forgot about the sore backs and the wet socks as we snuggled into our sleeping bags for another chilly night. The Osla-Har Ki Dun stretch is by far the steepest. If your physical preparedness is not strong, offloading your backpack may be a good option (if one is available to you). For at least 3 kms after Kalkati Dhar, there are no major water sources. Plan accordingly. In April the flowers are in full bloom. May will surely be even better. Don’t miss the wild flowers. Snowblindness is a real risk so wear sunglasses. Protect your skin; keep sunscreen (SPF 30 or more) and chapstick handy. Don’t forget to apply sunscreen to the back of your neck as well. Remember, when it shines in the snow, it scorches worse than what a day on the beach will do. Sleeping on snow has its own set of challenges. While the sub-zero sleeping bags and thick sleeping mats did a good job of keeping the chill out, what we were totally unprepared for is the SLIDE. Let me explain: Because of limited usable space, our tent had been pitched on a gently sloping patch. During the night, the snow under under our tent hardened and our sleeping mats became veritable sleds. Like dominoes, my two tent mates slid down in their sleep, landed on top of me, usurping the sleeping space that was supposed to be mine. We laughed about it in the morning but Sleepless-in-HKD wasn’t amused that he slid way more than he slept. Today’s trekking plan was truncated because Jaundhar glacier, past the Har-Ki-Dun valley, was deemed inaccessible by our guide due to too much snow. To be sure, it had seemed like a remote possibility even on day one but it still stung when the final verdict was delivered. Man proposes, nature disposes. Our trek guide offered a thought that made it easier for us to reconcile to the shortened trek: “You don’t go to the mountain; it is the mountain that calls you. Today, Jaundhar glacier is not calling us,” he spoke like a sage. After a hearty breakfast of paranthas, we grabbed our day packs and pushed off to explore the Har-Ki-Dun valley, some 2-3 kms away from our campsite. Albeit just for a day, it was refreshing to be liberated from the 60L monsters we’d been toting on our backs for all these days. Our mascots, blissfully unaware that we were not carrying any packed lunch on our day excursion, remained at our heels. Was it just force of habit or is it that dogs love exploring beautiful places just as much as we do? I wonder. With azure skies above us, we slogged through snow, stopping frequently for photographs. After all the walking we’d done, a 3km trek was merely a walk in the park. Besides, we knew had all the time in the world to return to our camp for lunch. But perhaps the real reason behind all these breaks was that the scenery was so stunning that it simply stopped us in our tracks. There was just so much to see and soak: Sparkling mountain streams gushing to meet the river; behemoth deodar trees flanking the valley floor; giant building-size boulders topped with a puffy crest of untouched snow. The climb to Har-Ki-Dun valley was surprisingly gradual; it takes you through a wide and mostly-level valley, but with a few super-steep sections thrown in to keep you from forgetting that you’re in the Himalayas. Digging our heels into the snow to avoid a nasty slip, we crossed vintage snow-covered wooden bridges, and steadily tread upward to the rocky outcrop where the forest rest house sits. The Har-Ki-Dun valley is surrounded by the Banderpunch range. One of the more well-known peaks in this range is the 6250-metre high Swargarohini peak. Regarded as one of the toughest peaks to scale due to its sharp drops, Swargarohini benevolently peers down at the bowl-shaped valley it skirts. The forest rest house, engulfed in 6-8 ft of snow sits locked and lonely. From the vista points near the rest house, we enjoy the dreamy winter wonderland for a couple of hours. No visit to snow country is complete without a friendly snow fight and a snowman. Someone in our group with strong feminist leanings decided to build a snowwoman instead. By noon, the cloud cover had started to thicken. This morning’s sunny weather had seemed sustainable; it encouraged some of us to skip the rain gear, a must-have accessory on any mountain. Not wanting to get caught in the rain, we bid farewell to the valley of Gods and started our walk back to camp. We’d barely returned when the flurries showed up at our doorstep. Within minutes, the clouds blotted out the sunshine, and notched up the chill in the air. The afternoon was packed with thunder, lightning, rain, hail, sleet, and snow flakes. Grateful that bad weather hadn’t marred our visit to the valley, we happily huddled under a rocky ledge to play the game of Mafia–and to enjoy the grand show nature had put on for us. It’s not without reason that the word incredible fits India like hand in glove.